Princessly Polished: Giveaway Reminder: Engagement Giveaway ends this Saturday! 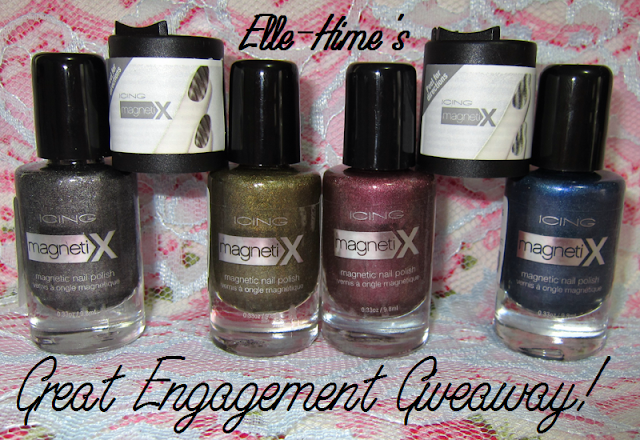 Giveaway Reminder: Engagement Giveaway ends this Saturday! This is just a quickie post to remind everyone that my Engagement Giveaway ends on March 10th - that will be the last day to submit your entries! Hopefully I'll be able to announce the winner by the end of next week. I was really happy to hear from both of my calendar giveaway winners - they received their prizes and they are being enjoyed - yay! I also want to apologize for my lack of posts. I have a bunch of stuff to share but I've been super-duper busy and as always blogging is only my (much loved) hobby. Real life comes first! I had a yucky nail break on Monday and that sort of took the ambition out of my nail painting, too.